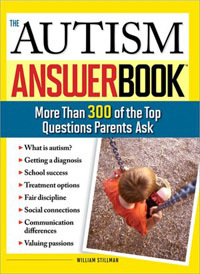 "Autism is a unique and different way of being, a natural variation of the human experience. Those who are autistic are often inherently gentle and exquisitely sensitive. They may perceive the world through a multifaceted prism more complicated and interesting than the view of those who are considered 'typical.' 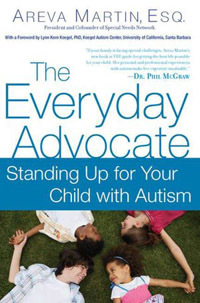 Theautistic esperience brings many gifts to appreciate and challenges to master ..."
More Than 300 of the Top Questions Parents Ask"
The Everyday Advocate by Areva Martin, Esq. "My experience has been that women seek to form personal friendships rather than mutually reciprocal business relationships. And in the work place, this can be fatal to our success. Women who want to advance their careers have to be strategic about the alliances they form." "... Behold, I make a covenant, Before all your people I will do marvels such as have not been done in all the earth, nor in any nation; and all the people among whom you are shall see the work of the Lord. For it is an awesome thing that I will do with you." The Special Needs Network (SNN) launched their 2nd Annual Summer Joe Patton Academy Camp "Camp JPAC" for typical and special needs children of all types. The Opening Day Reception was attended by sponsors (Walmart, Time Warner Cable, The WNBA LA Sparks, Farmers Insurance and The California Endownment) and Local Politicians including Assemblywoman, Holly Mitchell, LA City Controller, Wendy Greuel, LA County Supervisor, Mark Ridley-Thomas and Congress Woman, Diane Watson. Dignitary's included NBC News Reporter Beverly White, Dr. Purnell form The LAPD and Author, Monica Holloway. CBS News cameras were on site as well. It takes visionaries like Camp JPAC and SNN Founder, Attorney, Areva Martin who spoke passionately about these phenomenal programs, to find a way to serve the underserved with the excellence of our Divine Creator. Many people are Advocates and they don't even know it. There was a time I had to dig deep, stand up taller and stronger than I'd ever done before to simply ask for Non-Public Schooling for my children. 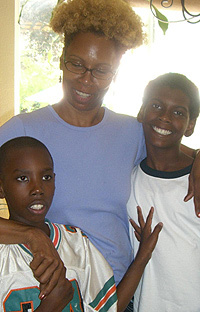 I became my two son's (diagnosed with autism) Advocate ... without recognizing the significance. When I found myself encouraging other parents (as others had encouraged me) to follow the steps I took to get better services for my children, I still didn't know I was being an "Advocate." Well I know it now. Are you an Advocate? Do you AD-VO-CATE? You are a MIGHTY WARRIOR! Advocates are SUPER HEROS! Win or loose AD-VO-CATE! Make a difference! Then KEEP IT MOVIN' Baby. There's usually another challenge around the corner. Advocacy for Special Needs is like a huge snow ball that has been pushed up hill for several decades. It has gotten bigger and bigger but with the cut backs in government and lack of real attention in legislation - nation wide - it's obvious we need to KEEP IT MOVIN! The Bible says in Matthew 10:13 "... whoever will not receive you nor hear your words, when you depart from that house or city, shake off the dust from your feet." KEEP IT MOVIN'! Continue to fight the good fight in faith! Advocacy is a battle ground and it's not for the faint at heart. It's not for the hostel either. It's a place where wise and strategic minds contribute, consult, negotiate and develope influence in order to command change. It doesn't happen over night. Ask, the Author of "The Everyday Advocate" Attorney, Areva Martin. After Areva's son, Ernest Martin III, "Marty" was diagnosed with autism she found her voice as an Advocate. She recognized how parents of special needs children in African American and Latin American communities lacked the services available in other, more affluent, communities. She began by sharing information. She soon realized that not everyone has a background that enables them to speak up and make demands. So she created the Special Needs Network (SNN), a non-profit organization, "to raise public awareness of developmental disabilities and to impact public policy, while providing education and resources to families, children and adults." SNN helps men and women become advocates for the needs of their family members. SNN has a large variety of workshops and programs throughout the year. Some of them are as follows. The Parent Training and Advocacy Program (P-Tap) "identifies underserved families of children diagnosed with autism spectrum disorder and other developmental disabilities and provides them with training, legal and technical assistance, skills development and networking that enables them to obtain resources and assist their children to obtain necessary life skills for a successful level of independence as adults." The Advocacy and Leadership Training Series gives "participants an opportunity to develop strategies to impact health, education and other related legislation at the local, state and federal level. Participants are trained on how to serve as non-profit board members, local and state commissioners, organizational leaders and community leaders. The course culminates with a field trip to the State Capitol in Sacramento where participants are provided an opportunity to meet with key legislators and policy makers." I've signed up for the next session which starts September 10th, 2011. Sing with me, "I'm goin' to Sa-cra-men-to. Sa-cra-men-to here I come." Snap your fingers. (Repeat to the tune of "I'm goin' to Kansas City.") "They got some hea-vy weight Legislators and I'm gon-na meet me one." Join me ... It's free ;-) Most importantly ... they provide QUALIFIED CHILD CARE!!!!!!!!!! Go to the SNN website. (See link above/left.) There's much much more! Talk about INSPIRATION! I'm excited, can you tell? I attended the Opening day of Camp JPAC and it felt as if I were attending a Gala for royalty! The Inner City Youth Orchestra was playing classical music under the Direction of Conductor Charles Dickerson. Elegant adults enjoyed an assortment of fruit and pastries as they sipped coffee, tea and juice. While children played in the luscious green field of grass in the middle of the campus of The Junior Blind of America, where the camp is being held. They thru balls, blew bubbles & gang tackled the giant fury Sparks mascot, Sparky. SNN Board Members stood proud. Supervising kids and answering questions, Camp Staff Members wore bright orange T-Shirts and reassuring confidence. Moms and Dads lingered and stayed not wanting to leave, the atmosphere was so joyfully infectious with possibility. Camp JPAC, where children age 3 to 16 enjoy a nurturing environment in which to grow. As she addressed her guests, Advocate-Author-Attorney-SNN Founder, Areva Martin described it as an Extraordinary Camp for Extraordinary children. Camp JPAC is a unique 30 day summer camp experience where special needs kids, along side their siblings, peers and typical kids (those without developmental challenges) become enriched in math, language, the arts, sciences, sports and more. WNBA Star, Candace Parker of the LA Sparks was at the opening ceremony. The Sparks sponsored the Basketball Program. Time Warner Cable sponsored the Mad Science Technology Program where the children build robots. And Union Bank donated 8 computers. Performing arts classes, dance, singing and classical music lessons are amazing courses featured at Camp JPAC. These disciplines readily offered in programs for typical kids are available through Camp JPAC, for children with special needs! It makes me wanna throw up both my hands and holla HAAAALLELUJAH!!!! The Special Needs Network, Camp JPAC and Advocate, Areva Martin, Esq. have impacted magnificent change in our lifetime. This is what God made us for ... to glorify Him in serving one another. This is true inspiration. It's AMAZING!!!!! Let's help them Keep it Movin'! Please forward this wonderful news to inspire those you know and love. Vana Thiero, Autism Advocate and Documentarian, also serves on the Board of Directors of two non-profit organizations: The Samaritan's House Foundation and Safe Passage. To learn more about these charities visit thesamaritanshouse.org and safepassagelives.org.